The meeting will run from Sept. 13 through 16, and will feature scientific presentations on the propulsion and other technologies that might be needed to send a probe to another star, as well as discussions of the social ramifications of becoming an interstellar civilization, and the biological consequences for humans traveling on multi-generation starships. 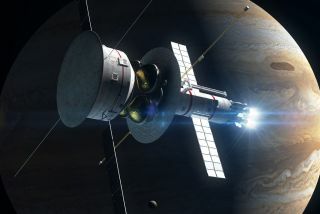 A special event will explore how art and fiction push the boundaries of science, while another will honor the 50 years of human spaceflight activities based out of NASA's Johnson Space Center here, and the anniversary of President John. F. Kennedy's speech charging the nation to send men to the moon. The conference is being held at the Hyatt Regency Houston, and is open to the public. Visit SPACE.com this week for complete coverage of the 100YSS Public Symposium.